Optomec Aerosol Jet printing technology effectively produces 3D printed electronics. Aerosol Jet technology enables 3D printed electronics. Electronic components such as resistors, capacitors, antennas, sensors, and thin film transistors have all been printed with Aerosol Jet technology. The performance parameters of printed components, for example the ohm value of a resistor, can be controlled through printing parameters. Components can also be printed onto 3 dimensional surfaces eliminating the need for a separate substrate thereby reducing the size, thickness and weight of the end product. For example, Aerosol Jet is used to print antennas and sensors that conform to the shape of the underlying substrate such as a cell phone case. The Aerosol Jet process supports printing on a wide variety of substrates including plastics, ceramics and metallic structures. Commercially available materials, such as nano-particle inks, have been optimized for the Aerosol Jet process to allow printing (and subsequent ink sintering) onto plastic substrates with low heat deflection temperatures. The Aerosol Jet process uses aerodynamic focusing to precisely and accurately deposit electronic Inks onto substrates. The ink is placed into an atomizer (1), which creates a dense mist of material laden droplets between 1 to 5 microns diameter (2). The aerosol mist is then delivered to the deposition head where it is focused by a sheath gas (3), which surrounds the aerosol as an annular ring. When the sheath gas and aerosol pass though the profiled nozzle, they accelerate and the aerosol becomes ‘focused’ into a tight stream of droplets flowing inside the sheath gas (4). The sheath gas also serves to insulate the nozzle from material contact preventing clogging. The gases used in the system are typically clean, dry Nitrogen or compressed air. The resulting high velocity particle stream remains focused during its travel from the nozzle to the substrate over a distance of 2 to 5 mm maintaining feature resolution on non-uniform and 3D substrates (5). The system is driven by standard CAD data which is converted to make a vector based tool path. This tool path allows patterning of the ink by driving a 2D or 3D motion control system. Printed features range from 10 microns to millimeters. Initial print targets for the Aerosol Jet technology were met in the range of 10 to 100μm line widths. Since then, feature sizes <10μm have been achieved. New wide area print heads also have been developed with the same flow principle that can print millimeter size features. Altogether, the demonstrated operating range of Aerosol Jet technology is 1000-fold (microns to millimeters). This has been achieved by the addition of more nozzles to a print head or the addition of multiple print heads to a system. 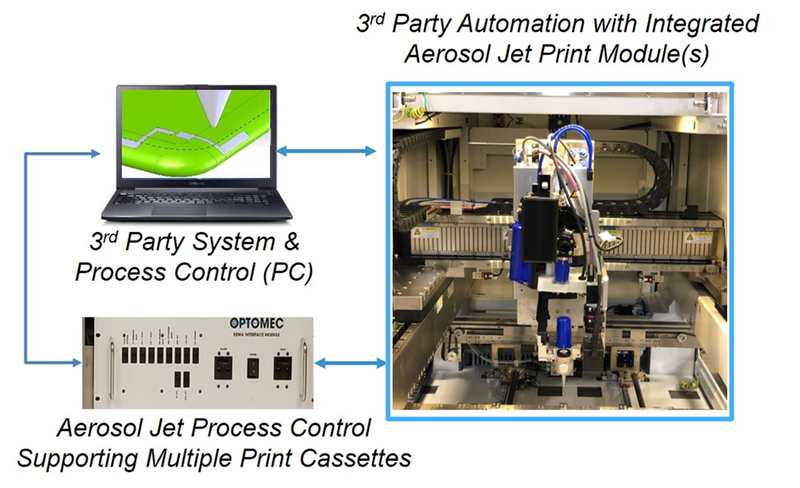 Aerosol Jet technology is available either in turnkey system configurations or as a modular print engine that can be integrated into automation platforms for high-volume production applications. The modular architecture is scalable and is designed to enable quick swap out of the Aerosol Jet Print Cassettes from the Print Heads for routine cleaning and ink refill. Optomec holds numerous patents and has many patents pending on its proprietary Aerosol Jet process and equipment. The idea of using printing technology to manufacture electronics dates back to the early 20th century, but its use for volume manufacturing didn’t become prevalent until the 1950s. Back then, photo plotters were used to produce master artwork circuit patterns on a clear mylar or glass substrate. The master artwork circuit pattern was then transferred onto a copper clad laminate coated with positive photoresist material. When exposed to light, the photoresist not masked by the circuit pattern became soluble and could be washed away leaving just the desired circuit pattern covered in resist material. An etching process was then used to remove the exposed copper leaving the desired circuit pattern. After removing the remaining photoresist from the circuit pattern, holes were drilled into the board and plated for mounting electrical components such as resisters, capacitors, integrated circuits. A wave soldering process was used to electrically connect the components to the circuits completing the printed circuit board (PCB) manufacturing process. More recently, other graphic printing technologies, such as ink jet and screen printing, have been used to fabricate printed circuit boards. All of these processes serve the electronics industry well, but have limitations. For example, with photo plotting, a new master artwork is required to implement design changes and the process is not environmentally friendly. And, since all of these processes were developed to print on paper – they can only be used to manufacture circuits on a flat surface. The new tool developed under this DARPA program was Aerosol Jet and this is how Aerosol Jet has become an additive manufacturing technology for 3D printed electronics. There are many conventional and emerging methods available for manufacturing electronics. For the most part, these methods represent either adaptations of graphic printing methods or new technology specifically designed for printing electronics. For many 2D applications conventional manufacturing methods work, but with smaller, thinner, smart connected devices used in consumer electronics, aerospace, health care and internet of things applications, new 3D manufacturing methods will be required. The chart below summarizes the advantages of Aerosol Jet technology for these applications.